Back by popular demand… SEASPAR is thrilled to have The Four C Notes return to the Tivoli Theatre in Downers Grove on Wednesday, April 10 for our annual concert fundraiser! 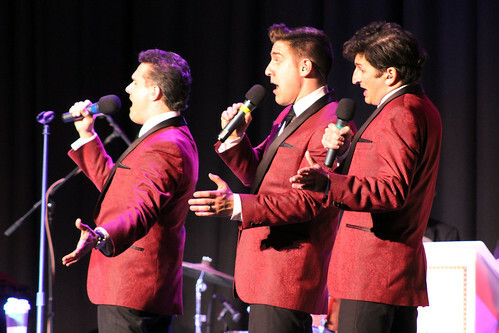 Pioneered and headlined by John Michael Coppola, best known for his appearance in Chicago’s long running production of the Broadway smash hit Jersey Boys, The Four C Notes are the Midwest’s only tribute dedicated to recreating the music of Frankie Valli and the Four Seasons. Backed by their 7-piece band, The Four C Notes will perform all of your favorite hits, including “Sherry,” “Big Girls Don’t Cry,” “Walk Like A Man,” “Workin’ My Way Back To You, (Babe),” “Can’t Take My Eyes Off Of You,” “Let’s Hang On,” and many more! Doors open at 6:30 p.m. and the show begins at 7 p.m. Tickets are $25 and seating is first-come, first-served. A cash bar and refreshments will be available for purchase. Tickets may also be purchased at the SEASPAR office, Anderson’s Bookshop, BankFinancial, or the Tivoli Theatre Box Office, all in Downers Grove. Tivoli Theatre is located at 5021 Highland Avenue in Downers Grove. This event is generously sponsored by BankFinancial. Don’t miss this one-night-only event that will transport you back to the heyday of doo-wop music, while benefiting SEASPAR’s programs and services! View photos and videos from last year’s concert on Flickr, or browse the gallery below!